Carl Sagan, also known as “the astronomer of the people”, was an American astronomer, astrophysicist, author and researcher. He made crucial contributions in popularizing astronomy to the public. He authored over 600 scientific papers and wrote several books about astronomy and natural sciences. He also gained worldwide fame for narrating and writing the popular 1980 television series “Cosmos: A Personal Voyage”. Carl Sagan was born in New York in 1934 to a garment worker, Samuel Sagan. His mother was Rachel Molly Gruber, a homemaker. When he was four, his parents took him to the 1939 New York World’s Fair. This became a turning point in his life and little Sagan developed an early interest in skyscrapers, science, space and the stars. His parents encouraged his growing interest in science by gifting him chemistry sets and books. After graduating from Rahway High School in 1951, he went on to acquire three different science degrees. Sagan was a lecturer and researcher at Harvard University until 1968. He then joined Cornell University in Ithaca, where he became a full Professor in 1971, and later, the director of the Laboratory for Planetary Studies. He remained at Cornell until 1981. Sagan authored more than 20 books about space and the universe. He won a Pulitzer Prize for his work. His TV series Cosmos still remains one of the most-watched shows in television history. Sagan helped NASA with U.S. space missions to Venus, Mars, and Jupiter. Particularly, his discovery of the high surface temperatures of the planet Venus is highly regarded. He also worked on understanding the atmospheres of Venus and Jupiter and seasonal changes on Mars. The 1997 film Contact has been inspired by Sagan’s book of the same name. Contrary to the popular belief that aliens would be destructive to mankind, Sagan advocated that aliens would be friendly and good-natured. Sagan is known to have been one of the earliest scientists to propose that there might be life on other planets. He encouraged NASA to explore the solar system for signs of life. He received the Public Welfare Medal, the highest award of the National Academy of Sciences, in 1994. In his last written works, Sagan contended that the possibilities of extraterrestrial space vehicles visiting Earth are vanishingly small. Sagan was married three times and had five children. 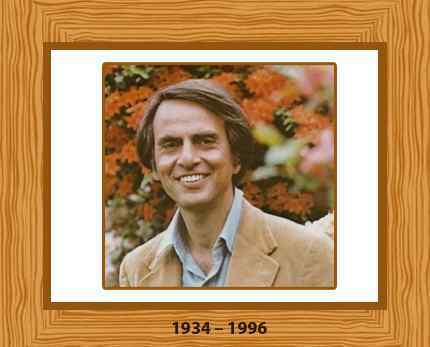 Carl Sagan died of pneumonia in 1996 at the age of 62.